♥ These adorable ceramic letter dishes are all the trend right now. ♥ Each dish is $8.99. You choose whatever you want to spell. ♥ They're perfect for all events such as weddings, bridal, reunions, baby showers, birthday parties, sweet 16, the big 21 or any event you're having. 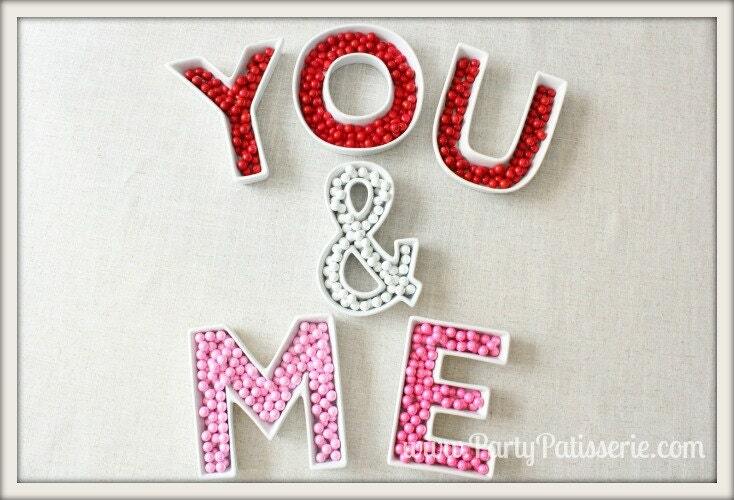 ♥ Just fill with candy, nuts, mints, gumballs or treats and spell out any word that fits your party! ♥ This listing shows YOU & ME, however, you can choose to SPELL whatever you like. ♥ The price of each dish is $8.99. When ordering, add each letter to your cart one at a time. If you have any difficulty ordering, just convo me and I'll help you out. ♥ The size of each dish is approximately 6" in length and 3/4" deep. ♥ We are happy to fill international orders! Please send me a convo so I can give you shipping cost.